For a glimpse back in time to when Chicago was considered a capital of architectural ornamentation, you need only take a walk down this quiet street on the city’s north side. The stretch of West Oakdale Avenue running between Sheffield and Seminary streets in the Lakeview neighborhood was designated a Chicago landmark in September of 2005. Here, curious visitors can find a clutch of old buildings that once housed the officers of the Northwestern Terra Cotta Company. The company was active in Chicago from 1878 through the early 20th century. In its heyday, it worked with some of Chicago’s most influential architects, such as Louis Sullivan, Daniel Burnham, and John Root, to produce the iconic, highly detailed works of earthenware that helped define that era of the city’s architecture. 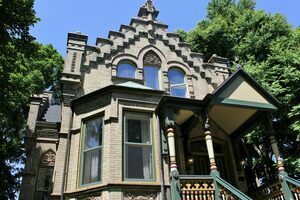 When approaching from the east, following a stately earthenware wall on the north side of the street will lead you to the crown jewel of the collection: The Henry Rokham House. Completed in 1887, the house displays a lavish selection of works in a range of styles of ornamentation—a calling card of sorts designed to reveal the breadth and versatility of the company’s artisanship. In addition to the bountiful terracotta on display, the house boasts an elegant set of stained glass windows. A closer look at the building’s west-facing wall will also reveal an intricately detailed relief of a woman at a spinning wheel etched into the brick.